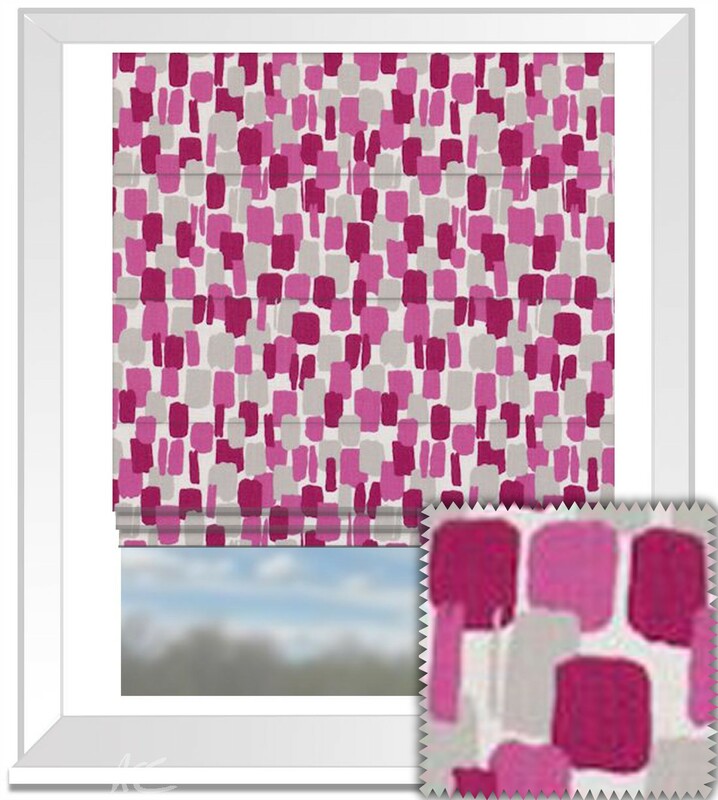 Clarke and Clarke La Vie Sundowner Summer Curtain Fabric is ideal for an elegant Roman Blind. 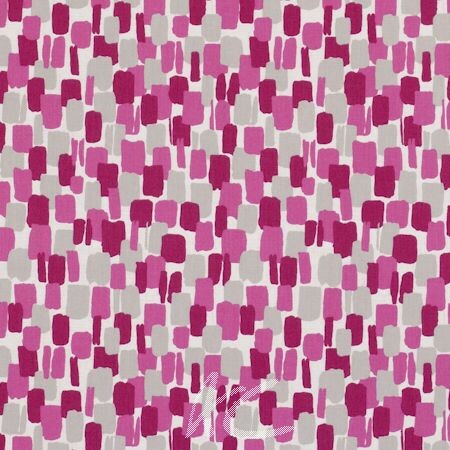 This stunning cotton fabric with its wonderful pink and grey toned geometric style would make a style statement in any home. Measure the width of the actual recess. Decide how far you wish the blind to overlap the recess at the sides. We advise that an addition of 5-10 cm normally works well. However you do need to take into consideration any obstructions that may affect how much room you have to attach the blind eg kitchen cupboards. When you have decided on the width of the blind record the measurement as the width. Measure the exact drop of the recess. Decide how far you wish the blind to overlap the recess top and bottom. We advise that an addition of 15-20 cm normally works well. The blind will be fitted above the recess, check there is enough space above for the blind to be attached. Record this measurement as the drop. The measurements you decide upon will be the exact finished size of your blind. Measure the width of the actual recess in three places, at the top of the recess, in the centre of the recess and near the bottom. Then take the smallest of these measurements. Record this measurement as the width of the blind. 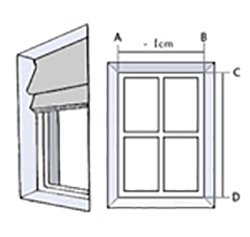 We will make the blind approx 1-1.5cm smaller than the measurement supplied, to allow the blind to pull up and down easily. Measure the exact drop of the recess again in three places, on the left hand side of the recess, in the centre of the recess and on the right hand side of the recess. Then as before take the smallest size. We will make the blind the length that you request. If ordering a Blackout Blind it is best to add 1-2cm to the drop to allow the blind to sit on the sill and block as much light as possible. The Roman Blind tape is stitched onto the blind through the fabric and blackout lining, pin holes of light will be visible where the fabric is machined to the tape. We have designed this page to answer all of our customer’s questions about their Roman Blind purchase. If we have missed something that should be included please let us know contact us. What will my Roman blind look like, are the folds cascading or regular? How long will my Roman blind be when it is pulled up? Will there be a join in the fabric on my Roman blind? If I order more than one blind in a fabric will the Roman Blinds match? What lining should I choose? How do I order a Blackout Roman Blind? Will my Cord Lock system be easy to fit? How do I measure for my blind? 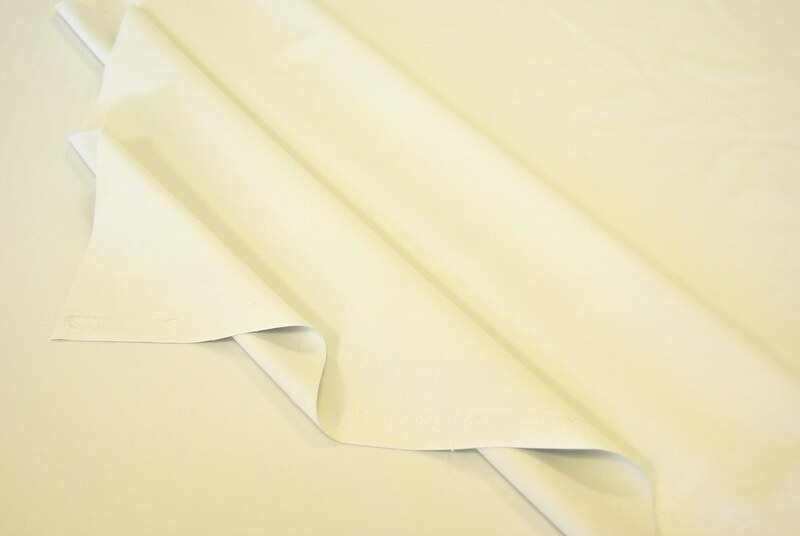 Our Roman Blinds are designed with Cascading folds. Cascading folds meaning that each fold is slightly bigger than the previous hence a cascading effect when the blind is raised. Cascading Roman Blinds allow you to see more of the Roman Blinds beautiful fabric and its pattern. The following table gives you an approximate guide to the drop of your blind when it is fully raised. Hence giving you an idea of the amount of your window that the blind will cover. 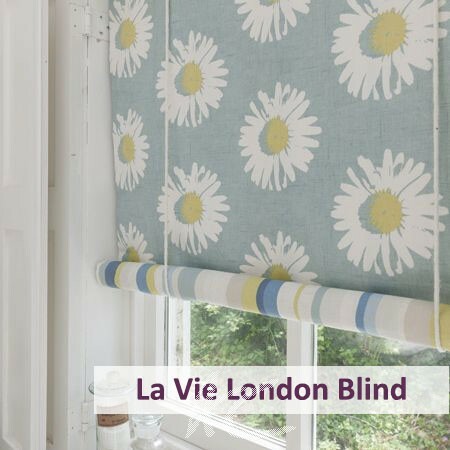 These measurments are only designed to be a guide as each blind is individual and these measurements are affected slightly by your fabric, lining and rail choice. 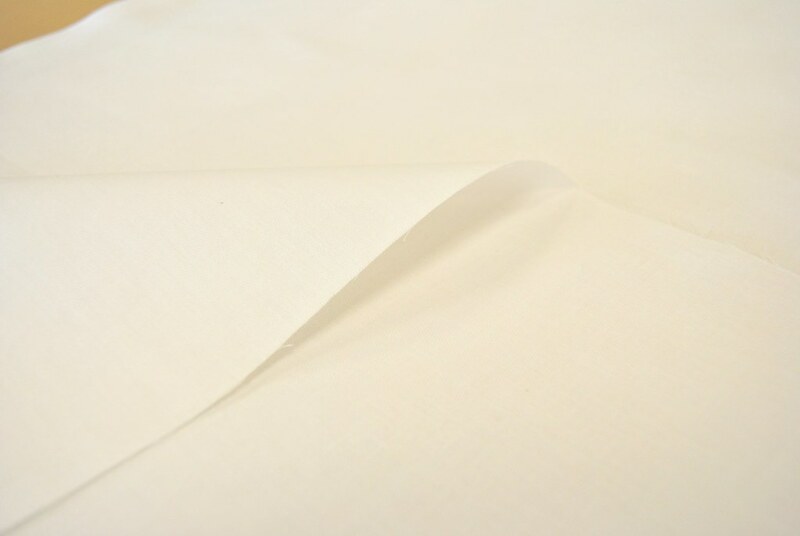 Our fabrics are mostly 137cm wide and as such we can only make blinds up to a width of 130cm without a seam. You can check the width of your chosen fabric by clicking on the fabric link under the photo in the quote box when purchasing. 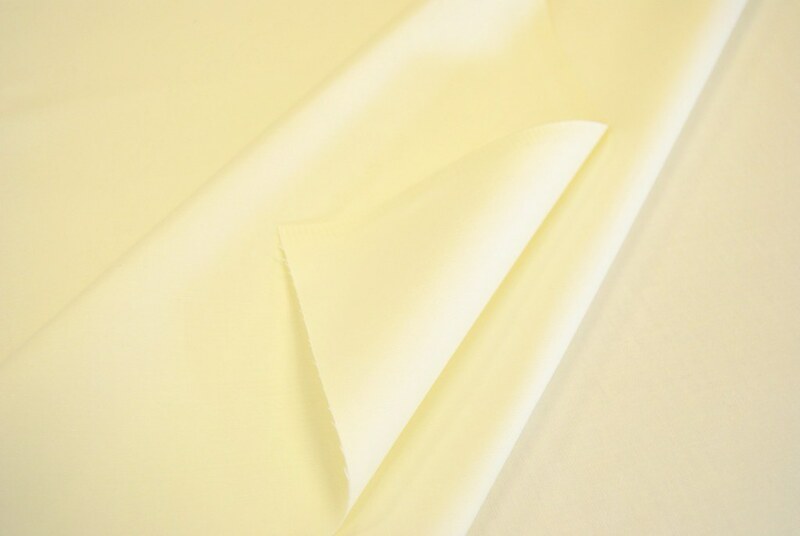 It is best to check this size for each fabric as they can vary. 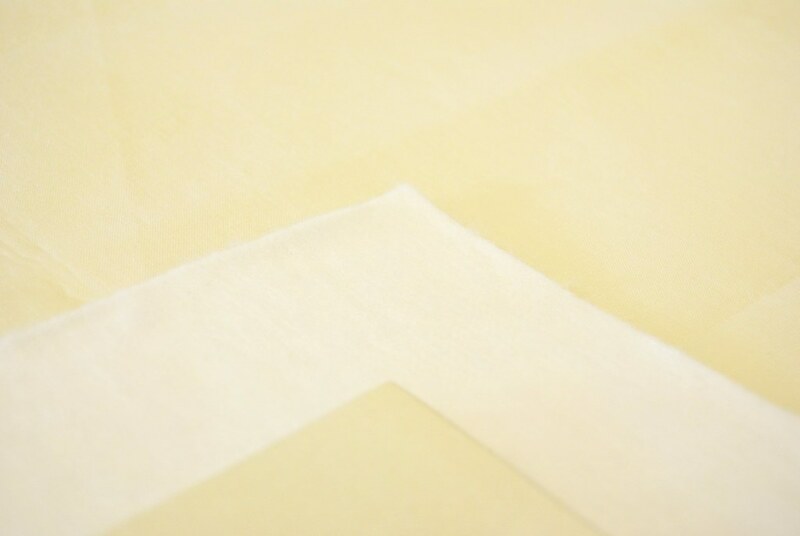 If the blind requires seams, as standard we place a panel of the fabric in the centre of the blind and a panel to each side of the centre panel. 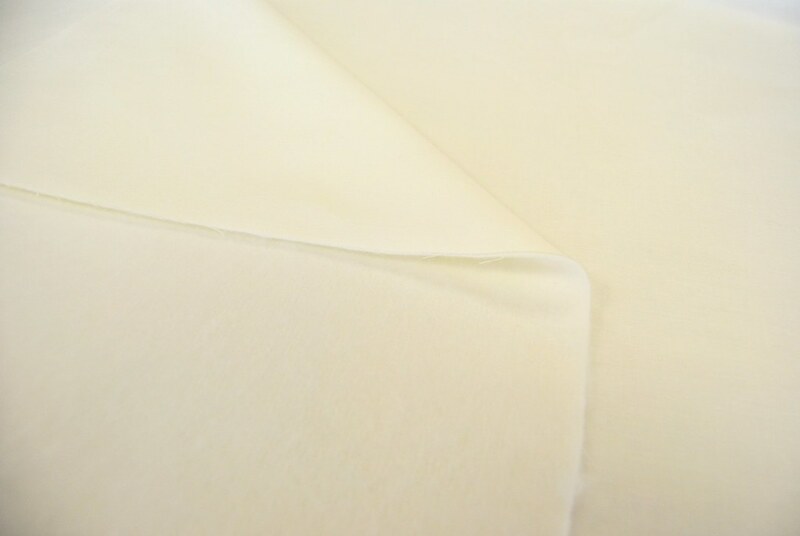 Seams can be made less obvious by choosing blackout lining so the light will not highlight the area of the seam. 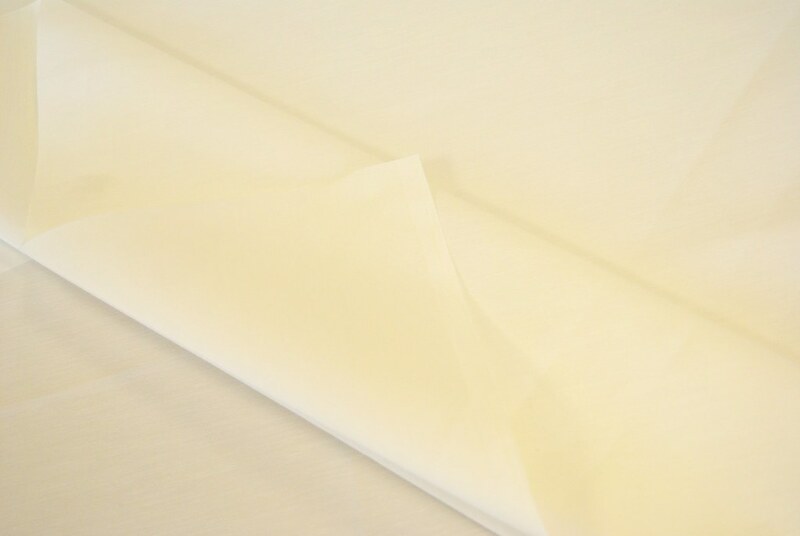 Seams are pattern matched to perfection to ensure the blind is as aesthetically pleasing as possible. Roman Blinds mounted on the outside of a recess will only reduce the light in the room as light still can be seen around the sides of the blind as the mounting brackets hold the blind out from the wall. The best solution to reduce the light is to mount the blind inside the recess. We provide Roman Blinds with two types of Rail System: Cord Lock and Deluxe Rotary. The cord lock sytem comes with a strong aluminum header rail with hook tape on the front for attachment of the blind. 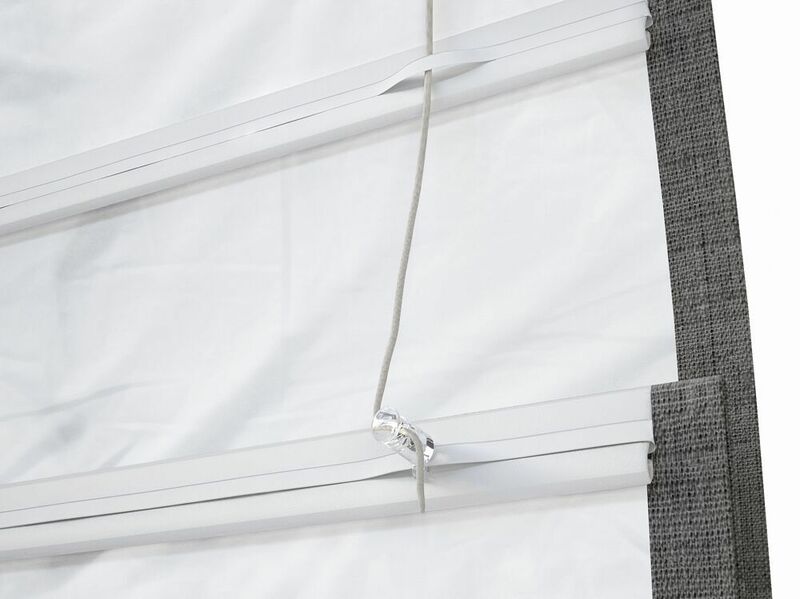 The cord locking mechanism allows the blind to be raised or dropped to the required height with no need for a cleat to secure the required position. 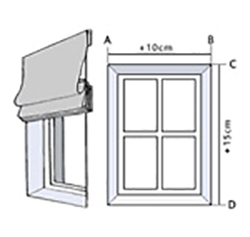 Blinds come with all required fittings and instructions. There is an acorn weight on the pull cord of this system which holds the cords taught. The deluxe rotary sytem comes with a strong aluminum header rail with hook tape on the front for attachment of the blind. The rotary system allows the blind to be raised or dropped to the required height by pulling on the rotary chain. Available with a white or chrome chain. When purchasing a Roman Blind from Alison Campbell or a Children's Roman Blind you can be assured that you will receive a blind that is Child Safe. 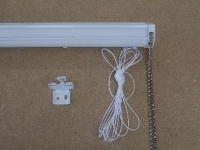 We have two Roman Blind Rail Systems available the Rotary System and the Cord Lock System . All of our Roman Blinds come with Breakaway Safety Toggles. The string of the Roman Blind then passes through the Safety Toggle. loops. 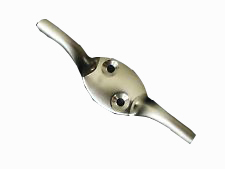 The Toggle will remain on the blind to avoid any choking hazard. The Rotary Rail system is as photographed below where it is operated by a chain be it white or chrome. 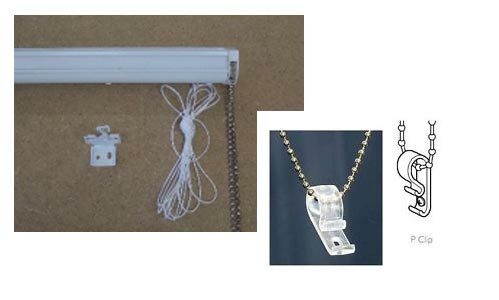 The chain is secured to the recess or wall with a P Clip as shown below. The chain runs through the P Clip to ensure the loop of the chain is not loose. 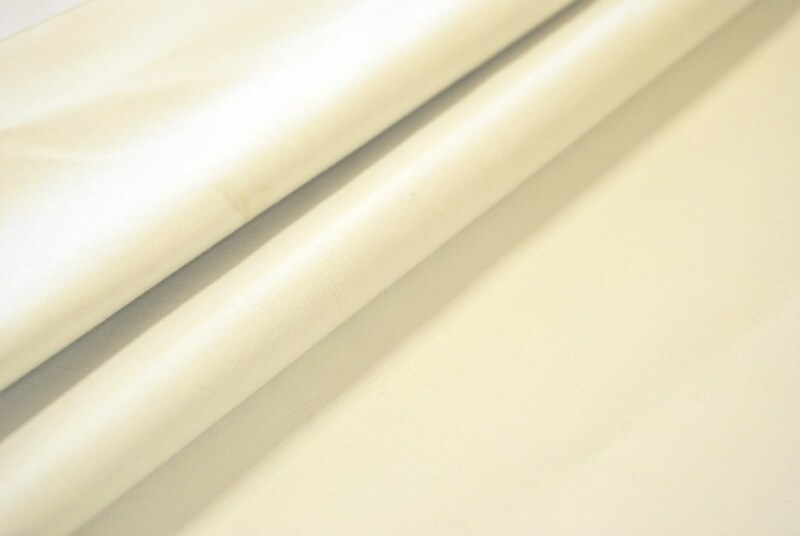 When ordering a Roman Blind you are asked for a measurement from floor to top of the blind this is to ensure that the bottom of the chain supplied is at least 150cm from the floor. The chain should always be secured with the P Clip supplied. 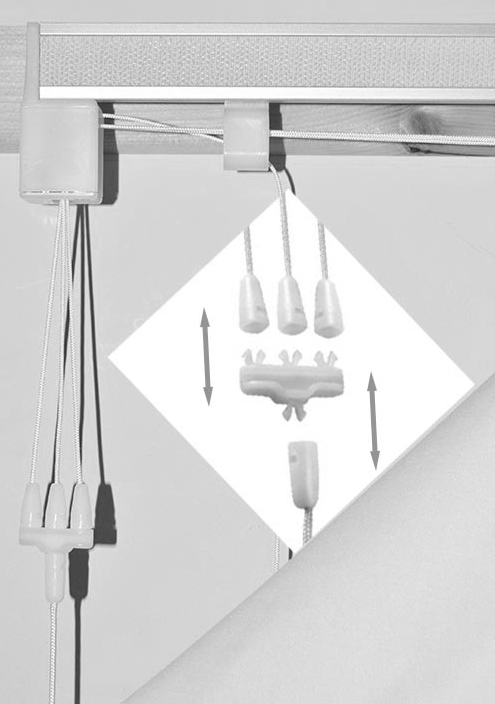 The cord snappers shown above will breakaway individually if 6kg of weight (the weight of an average 4 month old child) is applied to the strings hence preventing hazardous loops. 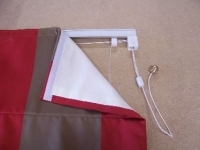 When the Roman Blind is raised the strings are secured around a cleat as pictured below, at a height of over 150cm from the floor to ensure the cords are safely out of the reach of a child.